Be the first to share your favorite memory, photo or story of Wadis . This memorial page is dedicated for family, friends and future generations to celebrate the life of their loved one. 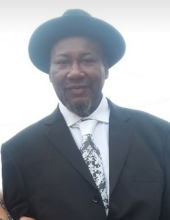 Price, Wadis, 61, of Louisville died Sunday December 16, 2018 at Norton Audubon Hospital. He was a native of Daviston, AL and a Baptist by faith. Survivors include a daughter Laekhaun Thomas; two sons Wadis Carter and Leshan Eddings (Heather); a brother Elvis Price; 6 grandchildren and 4 great grandchildren. His funeral service will be held 2:00 p.m. Saturday December 22, 2018 at W. P. Porter Mortuary 2611 Virginia Avenue. Visitation will be 12:00 noon to 2:00 p.m. Saturday. To send flowers or a remembrance gift to the family of Wadis Price, please visit our Tribute Store. "Email Address" would like to share the life celebration of Wadis Price. Click on the "link" to go to share a favorite memory or leave a condolence message for the family.